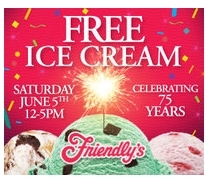 Friendly’s: Free Ice Cream 6/5! Reader Audra let me know that Friendly’s will be having Free Ice Cream on Saturday, 6/5 from 12 – 5pm at a participating Friendly’s. I would recommend calling your local Friendly’s restaurant just to be sure they are participating before you head out there. You can check out the info here. Free Sample: Nivea Touch of Happiness Body Wash! Hot Coupon: $2/1 Off Welch’s Juice!